At only 27.5mm thick QuietPanel is an ultra thin soundproofing system for party walls and has been introduced to upgrade any wall when space is extremely limited to help reduce noise nuisance from neighbours. The thinner QuietPanel soundproofing system for party walls has been developed to upgrade the soundproofing of existing walls that have very limited space due to the close proximity of windows or doors. QuietPanel can be fixed to both masonry and stud walls and is also suitable to reduce flanking noise up and down lightweight masonry walls. It is also a proved solution to upgrade walls that have failed a pre-completion sound test and meets Part E of the Building Regulations for noise control. Extra slim composition means little compromise on living space with high performance. The QuietPanel Acoustic Wall System is easy to install and available for fast delivery nationwide. For shipping reasons there is a min order of 5 panels per delivery. 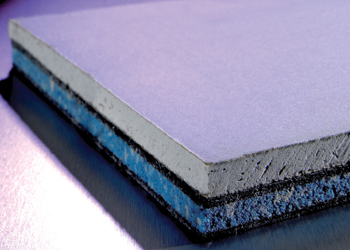 Composition 15mm of soundproofing material laminated to 12.5mm non-flammable, high density sound blocking outer panel. Note. These panels are produced with the sound insulation slightly short of the edges of the acoustic plasterboard and they are not as shown in the photos above. This is normal and does not affect the sound insulation these panels have been tested to provide. Due to the fragility of this product some damage to the edges and corners of the Acoustic Plasterboard can occur during transit. This will not affect the soundproofing properties of the product and any small damage can be repaired with our Acoustic Sealant after installation. If the damage is larger then it should be then fill with a Polyfilla type filler after installation and prior to decorating. Please see our Installation page above for a guide on how to install this system yourself. For expert fitting, we may be able to offer an installation service in some parts of the UK so contact us to see if we have fitters that work in your area. The installation will be performed to the highest standards by skilled and experienced tradesmen. These experts understand the importance of fitting acoustic materials absolutely perfectly and they have the specialist skills to ensure that all soundproofing materials are fitted correctly every time. As they are both experienced and skilled, they are also able to provide a highly efficient and cost-effective service. Acoustic Sealant must be used around the perimeter for maximum efficiency. Please note: This acoustic product is effective at reducing normal noise levels that should not normally be heard, for example talking, radio and TV sound. Loud music, loud noise and bass noise will always be audible although its intensity will be reduced. To reduce loud noise and bass or vibration our independent stud wall system should be installed. We do not accept any responsibility for the structural weight acceptance of any building and whether it can withstand the weight of any products or combination of products. If you are concerned we feel you may benefit from the advice of a professional at your own cost. Refunds will not be given under these circumstances. PLEASE BE AWARE THESE PANELS WEIGH 24.7KG EACH SO YOU MAY REQUIRE HELP LIFTING.